You can customize Spotlight’s search results on your Mac in numerous ways. You can sort outcomes by Kind (Documents, Mail Messages, and so on), Date (Today, Yesterday, Previous 7 Days, Previous 30 Days, Earlier), and People (Gilligan, Ginger, Skipper, and so on). You can also set various sorting preferences within a group. If the contents you’re searching for reside on the Mac before your very eyes (as opposed to another on your network), make sure the Search: This Mac button is the one you choose. The button to its immediate right refers specifically to either an open folder, or (if no folder was open) your home folder. Choosing either option tells Spotlight to look nowhere else but that folder. The next button, Shared, gives the Mac permission to search the other Macs in your network. But the Shared option will not appear if no other Mac is on your network with file sharing turned on. After Spotlight knows where to set its sights, you need to tell it what exactly you’re searching for. 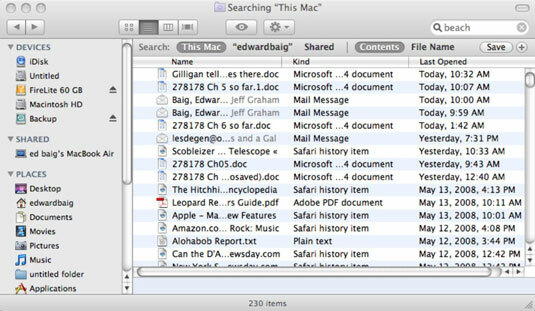 Do you want Spotlight to search for an item by its file name? Or do you want it to hunt for nuggets buried somewhere deep inside those files? If the former, click the File Name button; if the latter, click Contents. The best way to narrow results is to enter as specific a search term as possible right off the bat. As you plan your vacation, typing beach will probably summon the e-mail message Gilligan sent you. But because Spotlight will find all files or programs that match that text, results may also include PowerPoint presentations with a beach theme, pictures of your family by the seashore, and songs on your hard drives sung by the Beach Boys. Typing Gilligan and beach together will help you fine-tune your search.